Today’s record is tomorrow’s motivation Virtual Partner™ can turn any training session into a virtual matchup. 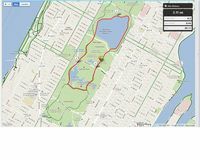 Letting you race your previous bests or challenge any activities uploaded to Garmin Connect™. Train with Christophe Le Mevel this winter with pre-planned training activities available for download at garmin.com/wintertraining. Garmin device. With Google maps, you can even show your local bike lanes in Kona, HI, jogging paths through Central Park, and even hiking trails in Whistler, BC to name a few great destinations! Once your course is saved, you can allow it to be stored publicly for users around theworld to view and they can send to their devices so they can experience your favorite route as well. This feature, we call Explore, is great when travelling to a new city, away on business or for those who want to break their same old routine and try a new route. You’ll also notice an improved ability to zoom on our number of detailed graphs when analyzing your most recent adventure. Whether you wear a wetsuit while participating in amateur triathlons, a life-vest while kayaking down river, or have a leash strapped between you and your paddle-board, we have the perfect device for you! Today we announced the Forerunner 910XT – the only all-in-one GPS-enabled device that provides detailed swim metrics and tracks distance, speed/pace, elevation and heart rate for running and cycling. The 910XT sports a sleek profile allowing users to easily slide wetsuits on and off, and has an on-board barometric altimeter for improved elevation data, all without sacrificing the size of its easy-to-read display. 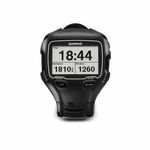 The Forerunner 910XT was announced in preparation for the Triathlon World Championship in Kona, HI, October 8, 2011, where it will be prominently displayed.